The complexities of societies impact the Early Childhood Education (ECE) sector as a whole – including the professionals working within it. Changes in societies challenge the workforce to grow and evolve. 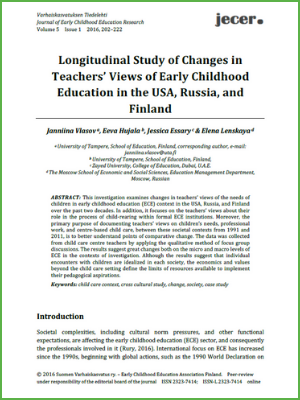 The research study, Longitudinal Study of Changes in Teachers’ Views of Early Childhood Education in the USA, Russia, and Finland, takes a look at the changes in teachers’ views of the needs of children in the aforementioned countries.Researchers documented teachers’ views about the needs of children, their professional work, and center-based child care between 1991 and 2011. Data was collected from teachers in child care centers through focus group discussions. Results suggest vast changes on both the micro and macro levels of ECE.